Formed in 1951 by Jack and Devora Brown, Fortune was an R&B label. The Browns had started off in the music business in 1947 when they formed a music publishing company. Four years later they decided to expand into recording, and set up shop in their home at 11629 Linwood Avenue. In 1955 they had a top ten R&B hit with Andre Williams and 'Bacon fat', after leasing the product to Erica. Neighbours were complaining bitterly about the noise coming from their premises, however, and this forced them to find a new location on Third Avenue. The year was now 1956 and Nolan Strong and the Diablos had become their top act. Nolan Strong was also responsible for a record played on the Northern Soul scene called 'Mind over matter' (Fortune546). Sides by Cozy and the Creshendals, Melvin Davis and Nathaniel Meyer are popular too. The company stopped producing records during the seventies but have done well in the reissue market, due to the quality of their material. At the beginning of the year 2001, arsonists reduced the structure to a shell, but you can still see the wall which seperated the offices and rehearsal rooms from the studio. 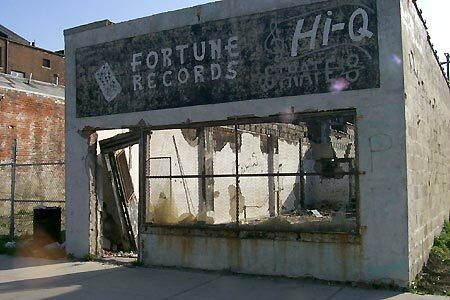 Now facing demolition, Fortune should have been accorded Historic Site status years ago.